Mahatma Gandhi is shown in steadfast concentration, perhaps reading or sitting at his iconic spinning wheel. Gandhi made significant inroads for oppressed people everywhere when he led India to independence from Great Britain, proving to the world the power of non-violent, passive resistance. 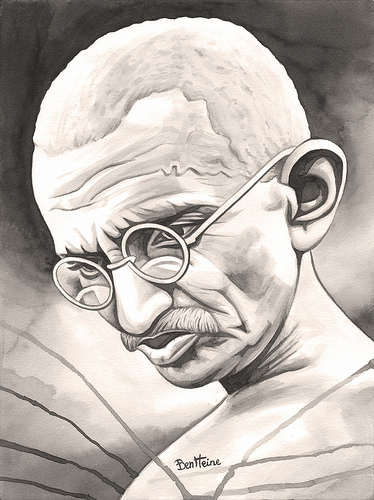 For the heroic story of Mahatma Gandhi. Dr. Martin Luther King Jr. also advocated peaceful non-resistance during the Civil Rights movement in The United States.